I am still working my way through my house, organizing the closets and our lives in general. 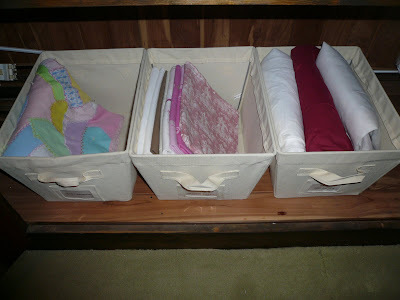 Recently, I organized the cedar linen closet. I really love labels. They just make me happy. Especially this type. It screams "Martha Stewart" to me for some reason. And I also love Martha. These canvas bins also make me happy (probably because they come with a little clear pocket in which I can stick my beloved labels). 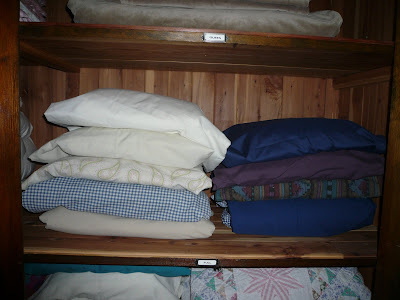 My great linen closet organizing tip of the day is this...fold your sheet sets as you normally do except for one of the pillow cases. Then stick the rest of the set in said pillow case so that it all stays neatly together and you don't have to rummage around to find the missing piece of the sheet set. Now, go forth and organize. Beautify a little corner of your world! If you still lack motivation for beautification...check out one of my favorite sites... The Inspired Room! Sheets inside of pillowcases?!? Wow, I never would have thought of that!! 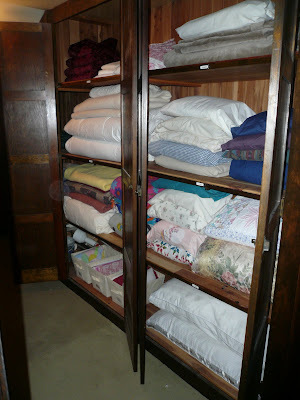 My linen closet is on my list for the weekend and I am soooo doing that! I am sooooo doing that!!! What an awesome idea! 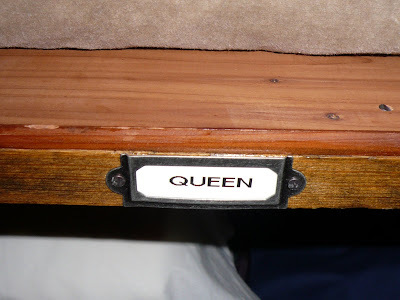 I have been thinking about purchasing a label maker..mainly because I have a gazillion cords lying around that I have no idea what they belong to! Any certain brand you're partial too?? That is a great tip. And that is an awesome sized linen closet. How B-U-TI-FUL you organized crazed woman you! I love the sheets in the pillow case idea --- so clever! Your closet looks so wonderfully organized. I have heard of the tip - stick your linens in a pillowcase but never have done it. You have inspired me! I love the pillow case tip! so helpful! Oh I love labels. When my husband wakes up at the a** crack of dawn to go round, he would look for socks with a flashlight in his drawer (because he knows better than to switch on the overhead light). Solution? 5 rectangular linen baskets from ikea with a label for each basket to tell him the color. So he can find navy socks without having to use a flashlight to figure out whether the other one it's black or not. I'm a good wife.